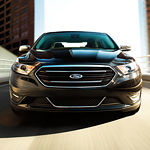 The Ford Taurus is elegant and designed to impress everyone that you drive by. Outside of the Taurus, you will find LED headlights and a distinctive, sophisticated grille. Both the headlamps and the taillamps are LED lights, actually, so you will have plenty of quality light to see wherever the road takes you at night. And the Ford Taurus also features dual chrome exhaust tips, as well as a superior wheel lineup. These things help to give the Taurus its' signature, sporty look. If you want to experience the beautiful features of a Taurus yourself, come down to the dealership and take one for a test drive.